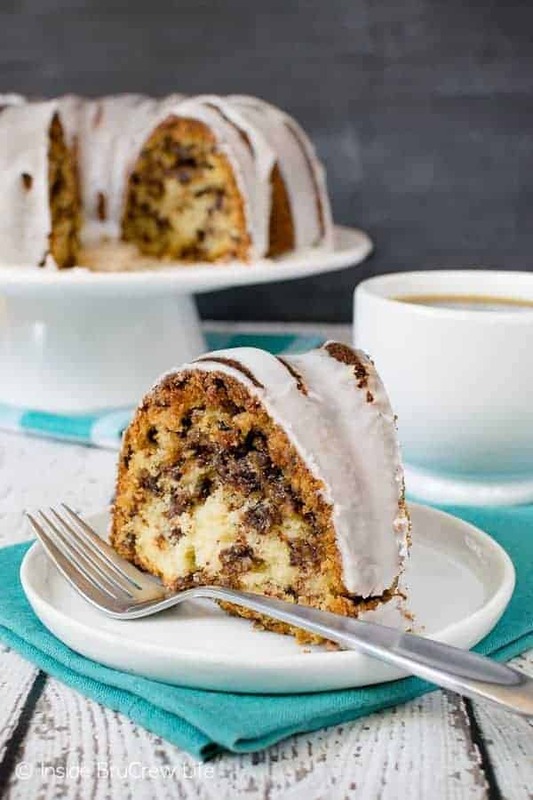 The Best Sour Cream Coffee Cake has a delicious cinnamon sugar swirl, chocolate chips, and a sweet glaze on top. 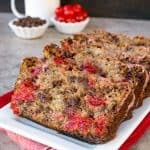 Great breakfast cake to go with your morning coffee. My oldest son chose Home Economics this year for one of his electives at school. Talk about making this foodie mom proud. Although, he did say he chose it because he thought it would be easy. He also wishes they would cook more than bake. Say what? I won’t be much help to him if they start cooking. But if he can learn to make dinner, that could be a good thing around here. The other day he brought home a recipe that he had to bake as “homework”. Man, I wish all homework was this fun to do. I can handle math when it involves measuring cups and sugar. He and I had so much fun working together. And by working together, I really mean I sat and supervised with a Dark Chocolate Latte while he baked cake. Measure your ingredients properly to ensure that your easy coffee cake bakes properly. We talked about the correct way to measure flour because I stopped him from scooping just in time. Did you know that you should never scoop flour out of the container? You need to fluff it first and then gently spoon it into a measuring cup. Use the flat edge of a knife to level off the cup before adding it to your batter. When you pack flour into a cup it adds extra flour. That extra flour can dry out your recipe or make your end product heavy and dense. I promise, he did all the mixing and all the pouring for this sweet breakfast cake. Well, for the first one that is. I had to make it again and take some new delicious looking pictures. At first I was trying to be good and only have one bite. But I must have blacked out because all of a sudden my entire piece disappeared. Hmmm I’m sensing a pattern because the same thing happened when I made this Banana Caramel Coffee Cake and this Banana Split Coffee Cake. 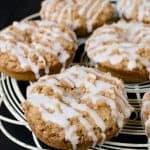 What makes this the Best Coffee Cake? 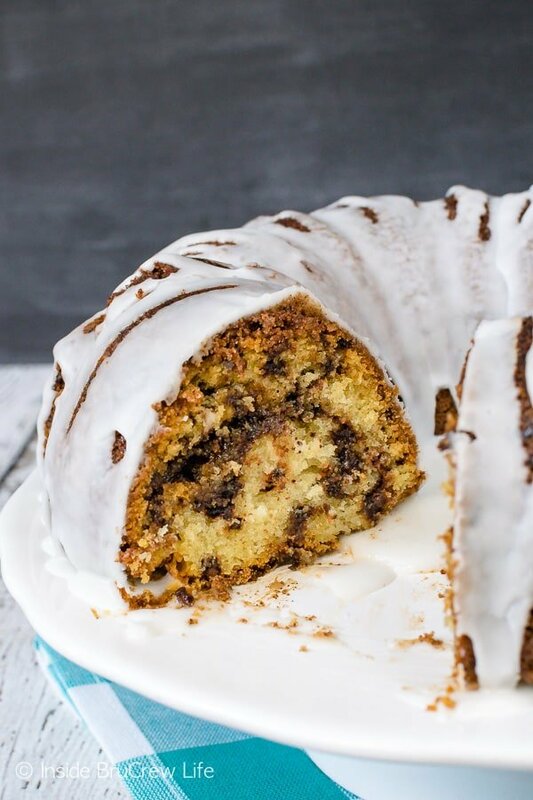 Sour cream and chocolate makes this glazed coffee cake taste amazing. Adding sour cream to the batter makes the cake so rich and moist. What I love about this cake is that it is tender and dense without being heavy at all. 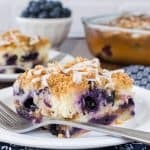 In fact, this breakfast cake is pretty light and has a great texture. Do I have to use sour cream in this cake? You can substitute Greek yogurt in place of the sour cream, if that’s what you have on hand. 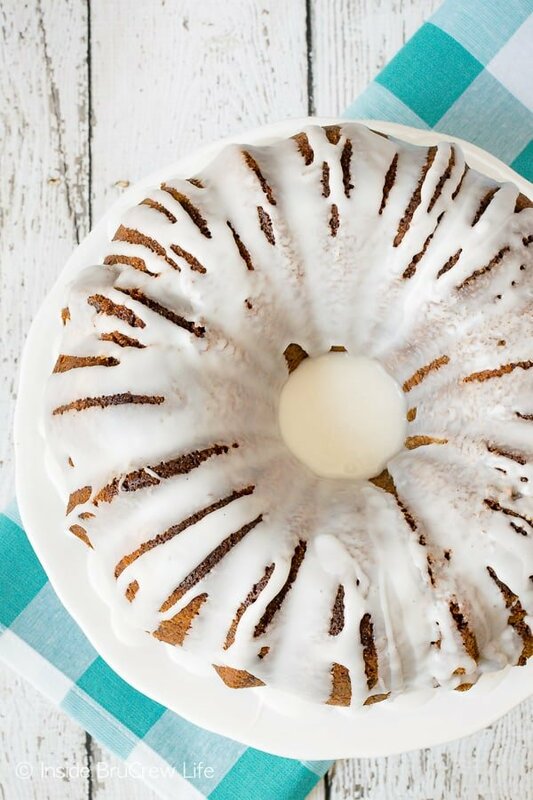 A whole milk yogurt will give this coffee cake the closest texture and taste. If you only have low-fat in your fridge, be sure to strain the extra liquid off first. 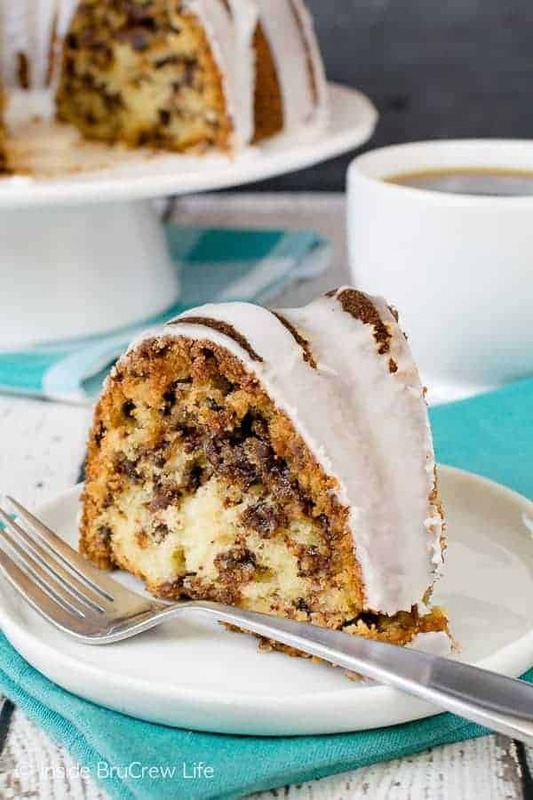 Another reason this cake is the best is the three layers of cinnamon sugar that adds pockets of goodness to every bite of this Sour Cream Coffee Cake. Chocolate also makes anything better. 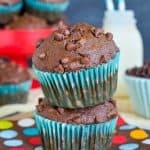 You could stir the chocolate chips into the crumble mixture if you want too, but I added them to the cake batter instead. Either way works and will taste delicious with your morning cup of coffee. Add the sugar mixture to the bottom of the pan, in the middle of the batter, and on top of the batter. Just make sure to flip the cake out of the pan within 10 minutes of it coming out of the oven, so the sugar doesn’t caramelize on the bottom of the pan. I had a small chunk stick to the pan. If a little bit does stick, just use a knife to loosen it and press it back into the cake. 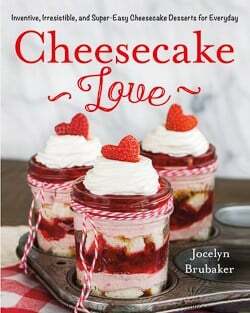 The glaze on top will hide any mishaps. Preheat the oven to 350 degrees. Spray a bundt pan with nonstick spray that has flour in it extremely well. Cream the butter and sugar until light and fluffy. Beat in the sour cream, eggs, and vanilla. Sift together the flour, baking powder, baking soda, and salt. Slowly add to the butter mixture. Mix together the topping ingredients. Spoon 1/2 cup topping into the bottom of the prepared pan. Spread 1/2 the batter into the pan. Sprinkle with 1 cup topping. Spread the rest of the batter on top. Sprinkle with the rest of the topping over the top of the batter. Bake for 45-50 minutes. Let the cake cool in the pan for 10 minutes. Place a large plate on top and flip the cake out. Let the cake cool. Mix together the powdered sugar and water. Drizzle over the top of the cake. Let set before slicing. Oh that all homework was so sweet! Looks like he did a great job. Congrats to your son. 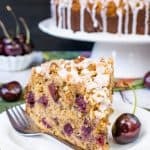 I couldn’t believe how addicting this cake was…I just kept saying, “just one more slice:-)” And I was thrilled to pieces when he told me he was choosing home ec!!! 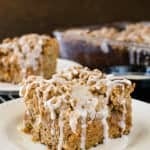 Oh you have no idea my weakness for coffee cake!!!! This looks amazing. Well done brucrew son! I wish I had homework like that when I was in school! This looks amazing! He did a great job! Oh how I love cake for breakfast! Major kudos to your son. He’s well on his way to being a pro! This is beautiful and reminds me of a cake my grandmother makes. Does your son want to come teach my hubby how to bake? What a BEAUTIFUL cake Jocelyn! Honestly – it is simply gorgeous. 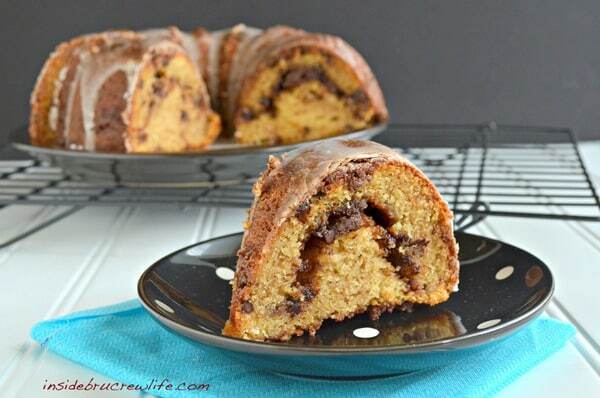 That chocolate brown sugar topping/swirl looks divine. I never took home ec when I was in school! I wish my homework was baking cakes though. I had to suffer through accounting homework! UGH! this just looks down right amazing!! Um, yes. That’s totally my kind of homework. Where do I sign up? Thank you so much! Isn’t it great how certain foods just remind us of great memories? I made this yesterday and it is fabulous. I made this last Saturday, and never got the chance to glaze it. The family dug right in fresh out of the oven and it was gone before the day was over. Thanks for the great recipe! This looks spectacular! going to try it right now with oil instead of butter. do you think that would work? I have never mad it with oil, so I’m not quite sure how it will do. I think it would be fine. Keep me posted on how it turned out! Love this! We make one but use a ‘popular’ baking mix as the base, then add the eggs, oil, sour cream to make the batter. it was featured on one of their boxes. Luckily I cut the box apart and kept it because it was never shown again. 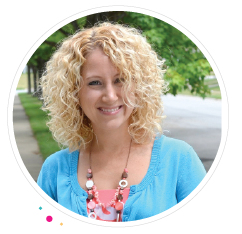 Thanks for the reminder… I need to make this again! 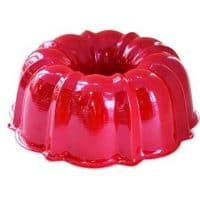 Can you make this in something other than a bundt pan? That drizzle!!! I want this for breakfast and dessert and every meal in between.